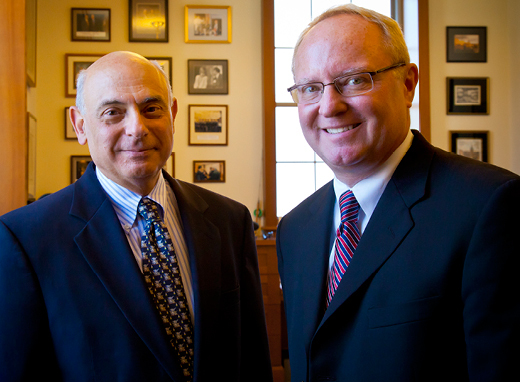 Michael Johns (left) has endowed a lecture named in his honor and hosted by the Department of Health Policy and Management, chaired by Kenneth Thorpe. This fall, the Department of Health Policy and Management hosted its second annual Michael M.E. Johns M.D. Lecture in Health Policy. Johns recently made a gift to endow the lecture, established in 2009 by Dean James Curran to honor Johns’ leadership of Emory’s Woodruff Health Sciences Center (WHSC). As head of the WHSC from 1996 to 2007, Johns implemented a comprehensive strategy that positioned Emory as one of the nation’s pre-eminent academic health centers in education, research, and patient care. He is widely renowned as a catalyst of new thinking in many areas of health policy and health professions education.